Home - Samy Informatics Pvt. Ltd.
Smart Android UHD (4K) - 43"
Smart Android UHD (4K) - 49"
Smart Android UHD (4K) - 55"
In today's world dreams about the future are always filled with gadgets. So, Samy Informatics Pvt. Ltd. under the brand name of SAMY have stepped into the world of electronic products. We all know that gadgets and pieces of technology have become almost our close friends without whose presence in our lives we are totally nonexistent in this beautiful world. As compared to the other brands we Samy is providing the best picture quality n sound. Picture contrast. "The feel of vibrant colors." Samy is giving the best quality accessories with the led tv at the best price to the customer end. As compared to the other brands we are providing the best accessories. TV QUALITY: Before Purchasing this i was confused Between LG & SAMY smart android - HD TV & the price difference was about 50% but concidering reviews i decided to purchase SAMY smart android - HD TV. Good TV at awesome price!! Excellent picture quality, comparable to top brands like Samsung and Sony. Great Display at this price. Pictures look clear and crisp and color balance is good. Everything in this price range is just Wow.. I belong to a small town Kanpur.. where ppl don't go for new brands easily.. Loved watching it on UHD, picture quality very good, some improvement could be done towards sound quality, not bad though. Within this price range, it's unbeatable. Overall a luxury TV, Must go for it...!!! 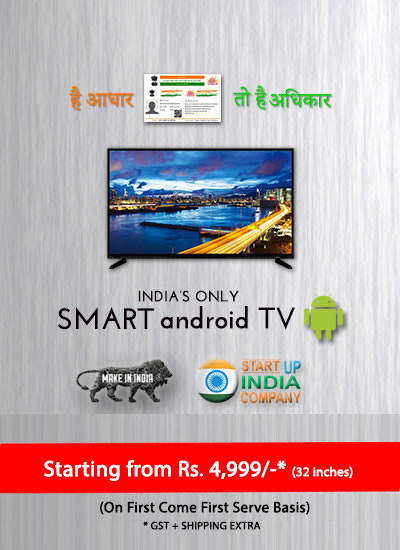 Awesome Tv yaaar in reasonable price happy with the product. © 2019 - Samy Informatics Pvt Ltd.